[7/6/18]Like trade, U.S. crude is moving in the opposite direction of global crude. Oil prices were mixed on Friday, July 6, as world benchmark Brent slipped on trade tensions while U.S. crude rose even though explorers added rigs. U.S. oil producers brought five rigs online for a total of 863, according to Baker Hughes (BHGE – Get Report) . Gas rigs remained unchanged at 187, and Miscellaneous rigs held steady at two, bringing the overall total U.S. rig count to 1,052. 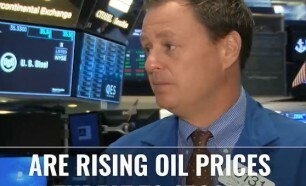 Futures of the U.S. crude benchmark, West Texas Intermediate, for August delivery rose 1.2% to $73.78 a barrel, while Brent crude tumbled 0.4% to $77.09 at 3:00 p.m. New York time. The gains in WTI appear to be a “short covering situation,” Bob Yawger, director of energy futures at Mizuho, told Reuters. WTI prices had been lower earlier in the day as the trade dispute between the U.S. and China teed off. Just after midnight on Friday, the U.S. imposed tariffs on $34 billion of Chinese goods, and China has responded in kind, setting the stage for a trade war between the world’s two largest economies in the midst of a tight oil market. Meanwhile, the Organization of Petroleum Exporting, or OPEC, is starting to ramp up production after agreeing to cut output in late 2016 in order to boost oil prices. The president personally called on Saudi Arabia to increase oil production, “maybe up to 2,000,000 barrels,” because crude “prices to [sic] high,” he said on Twitter last Saturday, adding that Saudi Arabia agreed. The Saudis reportedly pumped 10.488 million barrels per day in June, up 458,000 barrels per day month over month, OPEC sources told Reuters. Analysts at Bernstein, however, are warning that crude prices could spike to $150 a barrel because companies have not been investing enough into new production, instead focusing on boosting returns and shareholder distributions.